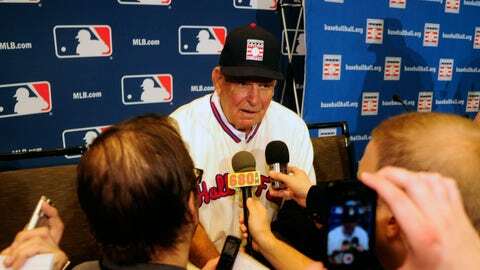 Former Braves manager Bobby Cox, who led the Braves to 14 straight division titles and 1995 World Series, was voted into the Hall of Fame by the Veterans Committee. "I’ve got goosebumps," Cox said at the announcement. "It’s the greatest honor you can ever have." Cox, 72, who played for the New York Yankees during the 1968 and ’69 seasons, went on to manage both the Toronto Blue Jays and Braves for 29 total seasons, posting 2,504 career wins (fourth-most all-time). He led Atlanta during its "Team of the ’90s" heyday, including the 1995 World Series title, five pennants and an unprecedented run of 14 straight division titles. "It should be without a doubt for either one of them (to be elected), especially with Greg," former Braves pitcher John Smoltz told MLB.com in November when the ballot was announced. "I know there’s been no unanimous (electee) in the history to the Hall of Fame, but I think (Maddux) would be it if there is. I’m biased. I watched Greg and Tom pitch my whole career, basically. They exemplified the fact that over 162 games, they were better than anybody else in the league."